There are many good arguments against Obama, even if the Republicans cannot seem to muster any. The civil liberties/antiwar case was made eloquently a few weeks ago by libertarian Conor Friedersdorf, who wrote a well-cited blog post on why he could not, in good conscience, vote for Obama. While his arguments have tremendous merit, there is an equally powerful case against Obama on the grounds of economic and social equity. That case needs to be made. For those who don't know me, here is a brief, relevant background: I have a long history in Democratic and liberal politics. I have worked for several Democratic candidates and affiliated groups, I have personally raised millions of dollars for Democrats online, I was an early advisor to Actblue (which has processed over $300 million to Democratic candidates). I have worked in Congress (mostly on the Dodd-Frank financial reform package), and I was a producer at MSNBC. Furthermore, I aggressively opposed Nader-style challenges until 2008. So why oppose Obama? Simply, it is the shape of the society Obama is crafting that I oppose, and I intend to hold him responsible, such as I can, for his actions in creating it. Many Democrats are disappointed in Obama. Some feel he's a good president with a bad Congress. Some feel he's a good man, trying to do the right thing, but not bold enough. Others think it's just the system, that anyone would do what he did. I will get to each of these sentiments, and pragmatic questions around the election, but I think it's important to be grounded in policy outcomes. Not, what did Obama try to do, in his heart of hearts? But what kind of America has he actually delivered? And the chart below answers the question. This chart reflects the progressive case against Obama. The above is a chart of corporate profits against the main store of savings for most Americans who have savings -- home equity. 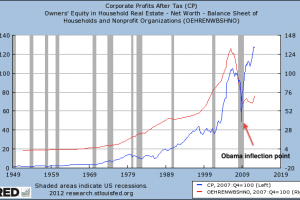 Notice that after the crisis, after the Obama inflection point, corporate profits recovered dramatically and surpassed previous highs, whereas home equity levels have remained static. That $5-7 trillion of lost savings did not come back, whereas financial assets and corporate profits did. Also notice that this is unprecedented in postwar history. Home equity levels and corporate profits have simply never diverged in this way; what was good for GM had always, until recently, been good, if not for America, for the balance sheet of homeowners. Obama's policies severed this link, completely. This split represents more than money. It represents a new kind of politics, one where Obama, and yes, he did this, officially enshrined rights for the elite in our constitutional order and removed rights from everyone else (see "The Housing Crash and the End of American Citizenship" in the Fordham Urban Law Journal for a more complete discussion of the problem). The bailouts and the associated Federal Reserve actions were not primarily shifts of funds to bankers; they were a guarantee that property rights for a certain class of creditors were immune from challenge or market forces. The foreclosure crisis, with its rampant criminality, predatory lending, and document forgeries, represents the flip side. Property rights for debtors simply increasingly exist solely at the pleasure of the powerful. The lack of prosecution of Wall Street executives, the ability of banks to borrow at 0 percent from the Federal Reserve while most of us face credit card rates of 15-30 percent, and the bailouts are all part of the re-creation of the American system of law around Obama's oligarchy. The policy continuity with Bush is a stark contrast to what Obama offered as a candidate. Look at the broken promises from the 2008 Democratic platform: a higher minimum wage, a ban on the replacement of striking workers, seven days of paid sick leave, a more diverse media ownership structure, renegotiation of NAFTA, letting bankruptcy judges write down mortgage debt, a ban on illegal wiretaps, an end to national security letters, stopping the war on whistle-blowers, passing the Employee Free Choice Act, restoring habeas corpus, and labor protections in the FAA bill. Each of these pledges would have tilted bargaining leverage to debtors, to labor, or to political dissidents. So Obama promised them to distinguish himself from Bush, and then went back on his word because these promises didn't fit with the larger policy arc of shifting American society toward his vision. For sure, Obama believes he is doing the right thing, that his policies are what's best for society. He is a conservative technocrat, running a policy architecture to ensure that conservative technocrats like him run the complex machinery of the state and reap private rewards from doing so. Radical political and economic inequality is the result. None of these policy shifts, with the exception of TARP, is that important in and of themselves, but together they add up to declining living standards. While life has never been fair, the chart above shows that, since World War II, this level of official legal, political and economic inequity for the broad mass of the public is new (though obviously for subgroups, like African-Americans, it was not new). It is as if America's traditional racial segregationist tendencies have been reorganized, and the tools and tactics of that system have been repurposed for a multicultural elite colonizing a multicultural population. The data bears this out: Under Bush, economic inequality was bad, as 65 cents of every dollar of income growth went to the top 1 percent. Under Obama, however, that number is 93 cents out of every dollar. That's right, under Barack Obama there is more economic inequality than under George W. Bush. And if you look at the chart above, most of this shift happened in 2009-2010, when Democrats controlled Congress. This was not, in other words, the doing of the mean Republican Congress. And it's not strictly a result of the financial crisis; after all, corporate profits did crash, like housing values did, but they also recovered, while housing values have not. This is the shape of the system Obama has designed. It is intentional, it is the modern American order, and it has a certain equilibrium, the kind we identify in Middle Eastern resource extraction based economies. We are even seeing, as I showed in an earlier post, a transition of the American economic order toward a petro-state. By some accounts, America will be the largest producer of hydrocarbons in the world, bigger than Saudi Arabia. This is just not an America that any of us should want to live in. It is a country whose economic basis is oligarchy, whose political system is authoritarianism, and whose political culture is murderous toward the rest of the world and suicidal in our aggressive lack of attention to climate change. Many will claim that Obama was stymied by a Republican Congress. But the primary policy framework Obama put in place - the bailouts, took place during the transition and the immediate months after the election, when Obama had enormous leverage over the Bush administration and then a dominant Democratic Party in Congress. In fact, during the transition itself, Bush's Treasury Secretary Hank Paulson offered a deal to Barney Frank, to force banks to write down mortgages and stem foreclosures if Barney would speed up the release of TARP money. Paulson demanded, as a condition of the deal, that Obama sign off on it. Barney said fine, but to his surprise, the incoming president vetoed the deal. Yup, you heard that right -- the Bush administration was willing to write down mortgages in response to Democratic pressure, but it was Obama who said no, we want a foreclosure crisis. And with Neil Barofsky's book "Bailout," we see why. Tim Geithner said, in private meetings, that the foreclosure mitigation programs were not meant to mitigate foreclosures, but to spread out pain for the banks, the famous "foam the runway" comment. This central lie is key to the entire Obama economic strategy. It is not that Obama was stymied by Congress, or was up against a system, or faced a massive crisis, which led to the shape of the economy we see today. Rather, Obama had a handshake deal to help the middle class offered to him by Paulson, and Obama said no. He was not constrained by anything but his own policy instincts. And the reflation of corporate profits and financial assets and death of the middle class were the predictable results. The rest of Obama's policy framework looks very different when you wake up from the dream state pushed by cable news. Obama's history of personal use of illegal narcotics, combined with his escalation of the war on medical marijuana (despite declining support for the drug war in the Democratic caucus), shows both a personal hypocrisy and destructive cynicism that we should decry in anyone, let alone an important policymaker who helps keep a half a million people in jail for participating in a legitimate economy outlawed by the drug warrior industry. But it makes sense once you realize that his policy architecture coheres with a Romney-like philosophy that there is one set of rules for the little people, and another for the important people. It's why the administration quietly pushed Chinese investment in American infrastructure, seeks to privatize public education, removed labor protections from the FAA authorization bill, and inserted a provision into the stimulus bill ensuring AIG bonuses would be paid, and then lied about it to avoid blame. Wall Street speculator who rigged markets are simply smart and savvy businessmen, as Obama called Lloyd Blankfein and Jamie Dimon, whereas the millions who fell prey to their predatory lending schemes are irresponsible borrowers. And it's why Obama is explicitly targeting entitlements, insurance programs for which Americans paid. Obama wants to preserve these programs for the "most vulnerable," but that's still a taking. Did not every American pay into Social Security and Medicare? They did, but as with the foreclosure crisis, property rights (which are essential legal rights) of the rest of us are irrelevant. While Romney is explicit about 47 percent of the country being worthless, Obama just acts as if they are charity cases. In neither case does either candidate treat the mass of the public as fellow citizens. Now, it would not be fair to address this matter purely on economic grounds, and ignore women's rights. In that debate with Ellsberg, advocate Emily Hauser insistently made the case that choice will be safe under Obama, and ended under Romney, that this is the only issue that matters to women, and that anyone who doesn't agree is, as she put it, delusional. Falguni Sheth argued that this is a typical perspective from a privileged white woman, who ignores much of the impact that Barack Obama's policies have on women, and specifically women of color. And even on the issue of choice, you could make a good case, as she does, that there's less of a difference between Obama and Romney than meets the eye. Sheth's piece is persuasive. Barack Obama is the president who hired as his lead economic advisor Larry Summers, a man famous for arguing that women are genetically predisposed to being bad at math. Unsurprisingly, Anita Dunn, a White House adviser, later called the Obama White House a "hostile work environment" for women, in large part because of the boys club of Rahm Emanuel and Larry Summers. Obama is the president who insisted that women under 17 shouldn't have access to Plan B birth control, overruling scientists at the FDA, because of his position "as a father of two daughters." Girls, he said, shouldn't be able to buy these drugs next to "bubble gum and batteries." Aside from the obvious sexism, he left out the possibility that young women who need Plan B had been raped by their fathers, which anyone who works in the field knows happens all too often. In his healthcare bill, Obama made sure that government funds, including tax credits and Medicaid that are the key to expanding healthcare access to the poor, will be subject to the Hyde Amendment, which prohibits their use for abortion. It's not clear what will happen with healthcare exchanges, or how much coverage there will be for abortion services in the future. As Sheth also notes, there is a lot more to women's rights than abortion. Predatory lending and foreclosures disproportionately impact women. The drug war impacts women. Under Obama, 1.6 million more women are now in poverty. 1.2 million migrants have been deported by the Department of Homeland Security. The teacher layoffs from Obama's stimulus being inadequate to the task disproportionately hit women's economic opportunity. Oligarchies in general are just not good for women. In terms of the Supreme Court itself, Obama's track record is not actually that good. As a senator, Obama publicly chided liberals for demanding that Sen. Patrick Leahy block Sam Alito from the Supreme Court. Meanwhile, Obama-appointed Supreme Court Justice Sonya Sotomayor has in her career already ruled to limit access to abortion, and Elena Kagan's stance is not yet clear. Arguing that Romney justices would overturn Roe v. Wade is a concession that Senate Democrats, as they did with Alito and Roberts, would allow an anti-choice justice through the Senate. More likely is that Romney, like Obama, simply does not care about abortion, but does care about the court's business case rulings (the U.S. Chamber went undefeated last year). Romney has already said he won't change abortion laws, and that all women should have access to contraception. He may be lying, but more likely is that he does not care and is being subjected to political pressure. But so is Obama, who is openly embracing abortion rights and contraception now that it is a political asset. In other words, what is moving women's rights is not Obama or Romney, but the fact that a fierce political race has shown that women's rights are popular. The lesson is not to support Obama, who will shelve women's rights for another three years, but to continue making a strong case for women's rights. So, what is to be done? We have an election, and you probably have a vote. What should you do with it? I think it's worth voting for a third party candidate, and I'll explain why below. But first, let's be honest about what voting for Obama means. This requires diving into something I actually detest, which is electoral analysis and the notion of what would a pragmatist do. I tend to find the slur that one need be pragmatic and not a purist condescending and dishonest; no one ever takes an action without a reason to do so. Life is compromise. Every person gets this from the first time he or she, as a kid, asks his or her dad for something his or her mom won't give him. If you are taking action in politics, you have to assume that you are doing it because you want some sort of consequence from it. But even within the desiccated and corroded notion of what passes for democracy in 2012, the claims of the partisans to pragmatism are foolish. There are only five or six states that matter in this election; in the other 44 or 45, your vote on the presidential level doesn't matter. It is as decorative as a vote for an "American Idol contestant." So, unless you are in one of the few swing states that matters, a vote for Obama is simply an unabashed endorsement of his policies. But if you are in a swing state, then the question is, what should you do? Now, and this is subtle, I don't think the case against voting for Obama is airtight. If you are willing to argue that Obama, though he has imposed an authoritarian architecture on the American system, is still a better choice than Romney, fine. I can respect honest disagreement. Here's why I disagree with that analysis. If the White House were a video game where the player was all that mattered, voting for Obama would probably be the most reasonable thing to do. Romney is more likely to attack Iran, which would be just horrific (though Obama might do so as well, we don't really know). But video game policymaking is not how politics actually works -- the people themselves, what they believe and what they don't, can constrain political leaders. And under Obama, because there is now no one making the anti-torture argument, Americans have become more tolerant of torture, drones, war and authoritarianism in general. The case against Obama is that the people themselves will be better citizens under a Romney administration, distrusting him and placing constraints on his behavior the way they won't on Obama. As a candidate, Obama promised a whole slew of civil liberties protections, lying the whole time. Obama has successfully organized the left part of the Democratic Party into a force that had rhetorically opposed war and civil liberties violations, but now cheerleads a weakened America too frightened to put Osama bin Laden on trial. We must fight this thuggish political culture Bush popularized, and Obama solidified in place. But can a third-party candidate win? No. So what is the point of voting at all, or voting for a third-party candidate? My answer is that this election is, first and foremost, practice for crisis moments. Elections are just one small part of how social justice change can happen. The best moment for change is actually a crisis, where there is actually policy leverage. We should look at 9/11, Katrina and the financial crisis as the flip side of FDR's 100 days or the days immediately after LBJ took office. We already know that a crisis brings great pressure to conform to what the political establishment wants. So does this election. We all know that elites in a crisis will tell you to hand them enormous amounts of power, lest the world blow up. This is essentially the argument from the political establishment in 2012. Saying no to evil in 2012 will help us understand who is willing to say no to evil when it really matters. And when you have power during a crisis, there's no end to the amount of good you can do. How do we drive large-scale change during moments of crisis? How do we use this election to do so? Well, voting third party or even just honestly portraying Obama's policy architecture is a good way to identify to ourselves and each other who actually has the integrity to not cave to bullying. Then the task starting after the election is to build this network of organized people with intellectual and political integrity into a group who understands how to move the levers of power across industry, government, media and politics. We need to put ourselves into the position to be able to run the government. After all, if a political revolution came tomorrow, could those who believe in social justice and climate change actually govern? Do we have the people to do it? Do we have the ideas, the legislative proposals, the understanding of how to reorganize our society into a sustainable and socially just one? I suspect, no. When the next crisis comes, and it will come, space will again open up for real policy change. The most important thing we can use this election for is to prepare for that moment. That means finding ways of seeing who is on our side and building a group with the will to power and the expertise to make the right demands. We need to generate the inner confidence to blow up the political consensus, against the railings of the men in suits. If there had been an actual full-scale financial meltdown in 2008 without a bailout, while it would have been bad, it probably would have given us a fighting chance of warding off planetary catastrophe and reorganizing our politics. Instead the oligarchs took control, because we weren't willing to face them down when we needed to show courage. So now we have the worst of all worlds, an inevitably worse crisis and an even more authoritarian structure of governance. At some point soon, we will face yet another moment where the elites say, "Do what we want or there will be a meltdown." Do we have enough people on our side willing to collectively say "do what we want or there will be a global meldown"? This election is a good mechanism to train people in the willingness to say that and mean it. That is, the reason to advocate for a third-party candidate is to build the civic muscles willing to say no to the establishment in a crisis moment we all know is coming. Right now, the liberal establishment is teaching its people that letting malevolent political elites do what they want is not only the right path, it is the only path. Anything other than that is dubbed an affront to common decency. Just telling the truth is considered beyond rude. We need to build a different model of politics, one in which people who want a different society are willing to actually bargain and back up their threats, rather than just aesthetically argue for shifts around the margin. The good news is that the changes we need to make are entirely doable. It will cost about $100 trillion over 20 years to move our world to an entirely sustainable energy system, and the net worth of the global top 1 percent is $103 trillion. We can do this. And the moments to let us make the changes we need are coming. There is endless good we can do, if enough of us are willing to show the courage that exists within every human being instead of the malevolence and desire for conformity that also exists within every heart. Systems that can't go on, don't. The political elites, as much as they kick the can down the road, know this. The question we need to ask ourselves is, do we?